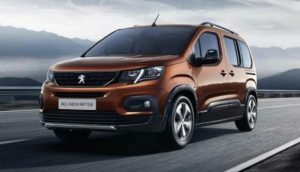 The Peugeot Partner Tepee has been replaced with the new Rifter, it is a sister car to the Citroen Berlingo and Vauxhall Combo Life. 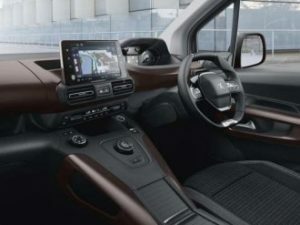 As with the old model the Rifter has sliding rear doors, LED daytime-running lights, Peugeot’s latest slimline grille and its i-Cockpit interior (small steering wheel and high-set dials), three individual and easily folding back seats, flat boot floor and large rear tailgate with virtually no loading lip, new for this model is electric rear windows. On the road it deals with imperfections in the road well and it takes the worst surfaces or holes in the road to really send shudders through to the occupants. 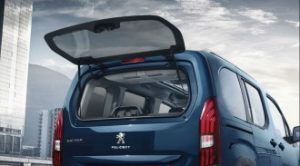 The Peugeot Rifter now comes in Standard or Long sizes, Long adds a third row of seats and 35 cm to the length, the five seat version boasts a 775 litre boot, which grows to 3,000 litres if you drop the rear seats, the Long increases this to 3500 litres with the seats folded. Three trim lines are avaialble, Active, Allure and GT-Line, Active cars have 16 inch steel wheels, black front and rear bumpers, aluminium roof bars, electric front windows and door mirrors, air-conditioning, DAB radio, Bluetooth, USB connection and automatic lights and wipers, Allure trim is the pick as you add, 16 inch alloy wheels, body coloured bumpers, LED daytime running lights, electric parking brake, electric front and rear windows, rear parking sensors, 8.0-inch touchscreen media system with Apple CarPlay and Android Auto, height adjustment for driver’s seat with under-seat storage and armrest, tray tables for second-row passengers and storage compartment between front-row seats. The (sporty) GT Line has 17 inch alloy wheels, Sat-nav, panoramic glass roof, three independent seats on second row, dual-zone climate control, keyless entry and ignition, power-folding door mirrors, tinted rear windows and an opening rear window in the tailgate. The Rifter shares its engine range with the Citroën Berlingo and Vauxhall Combo Life, and it starts with a 109bhp 1.2-litre Puretech petrol engine, the 128 version due for 2019. There are also two 1.5-litre BlueHDi diesel engines with 99bhp and 128bhp. The 128bhp engine is a surprisingly smooth and punchy performer, never emitting more than a background hum around town and even fading into the background completely at higher speeds 0-62mph in just 10.4sec as a six speed manual and 10.8 as an 8 speed auto. The 99bhp diesel (five speed manual only) is also quiet and smooth, and despite being around two seconds slower from 0-62mph, it’s still a nice torquey engine that pulls well from low revs, all three return a claimed 65.7 miles per gallon, If you opt for the EAT8 automatic, a rotary dial selects the gears just like in a Jaguar or Land Rover. The 1.2-litre PureTech petrol, with 109bhp, can return a claimed 51.4 miles per gallon and reach 62 in 11.7 seconds as a 6 speed manual only. *add £600 to AP for GT-Line prices, and a further £200 for the Visia pack which adds front parking sensors and reversing camera.